During the holidays I fill our candy jars with cookies and well, candy. . . but then they go back to holding our memories. 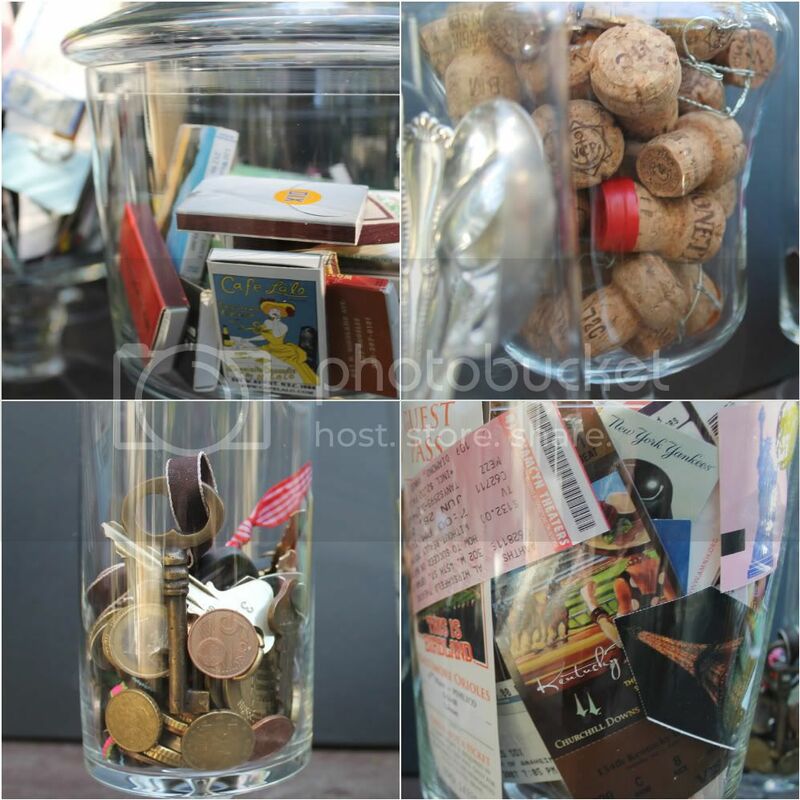 The jars are filled with matchbooks, champagne corks, old keys, foreign coins, subway tokens, ticket stubs. . . It's almost impossible to find a restaurant that still gives out matchbooks...they are the perfect little souvenir to remember an evening. Or tickets...we have saved every ticket to every concert, Broadway show, horse race, baseball game and every sporting event you can think of...Circle Line tickets, The London Eye, the Eiffel Tower, museum buttons...and before you know it all we'll do is show them our smart phone as we enter. Tickets will become a thing of the past and they already are in many cases. I love technology, without it we would not have many things...blogs being on the list, but I'm a little sad when I see our jars filled with things that may become obsolete. Does this bother anyone else? I was just wondering. oh i'm so jealous that you've saved all your ticket stubs. what a wonderful idea and what great memories right at your fingertips. i have some really special ticket stubs from concerts when i was a teen and a few plays here and there but nothing like your collection annie. how wonderful! What a smart way to organize and display them. Very smart. Do you display these all as a group or do they live in different places? You're right about matches but I always grab a book or box anytime I see a restaurant that has them. I too collect matchbooks from restaurants and hotels and I am so disappointed that they don't give them out anymore. I have always hesitated to use the matches from them. 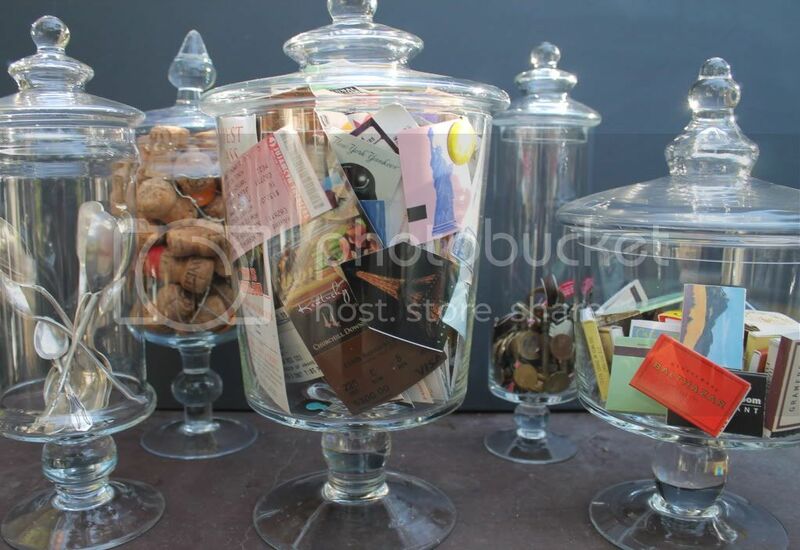 I love this idea of displaying them in glass jars. I love the matchbooks and ticket stubs! Clever! I have saved almost every single wine cork for the past 10 years. They fill various glass jars in our bar cabinet and I just love them! I do love your displays and what precious memories of concerts, operas and plays. I have saved letters written to me by my late mother and aunts and sister. Letter-writing is becoming a thing of the past too. Oh gosh, as a former smoker I used up all my matches and as a non drinker I have no more corks. But boy do I have memories! Your jars are beautiful and effortlessly charming. What a beautiful, sentimental collection! I have a large jar with matchbooks but not anything I display and yes, I do wish they still gave them out. It's so fun to reminisce! I love this! I have huge Anchor Hocking jars that I've filled with things like ribbon or even those dishwashing tabs that I keep under the sink. But memories...that's awesome! Hi Annie. Yet another amazing post and decor idea. I always love seeing what you come up with. I still plug all of our schedules into a traditional paper calendar each year. I never use the calender on my iPhone or computer. I also love reading actual magazines and books. There is no better smell than a new book. I agree and could kick myself for letting some of these go a while back. Your treasures look so pretty in the jars. Collectors unite! I've never met a glass jar of any type that doesn't look so much nicer with treasures in them. Matchbooks are definitely becoming extinct. We have collected them through the years of travel. I love when I see a particular one peering through the glass jar my mind immediately goes to the associated memory. We have so many from our travels to Las Vegas over the last 30+ years. Some of the properties are no more but yes, the memories will never fade. Love your collections-Great post! 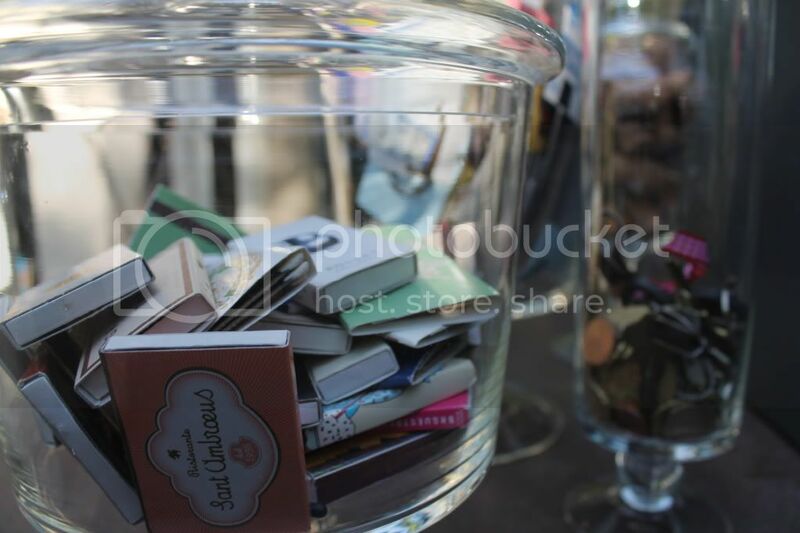 Love this idea Annie, what a great way to keep a collection of memories. I love technology too, but I still like to collect. I cannot get used to books and magazines on the computer. I love the feeling of flipping through the pages and tearing out inspiration. What a great idea and sweet collection - too bad I didn't see this years ago! Stop by the blog today if you can - it's a good day to visit! Short answer, yes it does! In fact it's quite a bug bear of mine. But hopefully we're a while yet from not being able to find these things at all. Keep collecting! You have an amazing talent for making ordinary things look beautiful. I especially love the coins and keys. I also have a jar with corks. It's fun to look back on bottles you loved. You have given me an idea for all the old foreign coins we have. I too lament the doing away with paper things like tickets and calendars. I keep all our tickets and have all our european sub stubs! There is something romantic about looking back on it all. My husband keeps trying to get me off a paper calendar and use the phone one. I couldn't even find a decent calendar this year. I think they are printing less and less. I found a daily one at Papyrus and am making my own designs with ticket stubs and the like! I love your collections in jars! Such a cleaver idea. What a great way to remember places you've been, events and restaurants. While I am happy with technology, it does seem strange that so many of these things are becoming obsolete. Funny I have a few of these, one for my bathroom filled with bath salts and the other in the kitchen filled with gumballs! I think they make beautiful containers. I have gotten them on sale for next to nothing at Pier One. I love all of your jars full of memories! I too miss matchbooks - my parents always had jars full of matchbooks from the places they went, but they are hard to find now. I like saving corks and money from the country's I've visited too! I love the story they tell when all together! Oh, so many wonderful memories in your lovely jars! They look happy... filled with love! About a year ago we went through my husbands old match book collection... Oh, what fun to reminisce about the wonderful restaurants, each had a story! What a wonderful way to store memories. It would be great to have you join me at Seasonal Sundays. Love the way this looks and such a practical way to save memorabilia! Very nice! I love this idea. I have a drawer in an antique table in Mammoth that I fill with mementos...but they are hidden until someone thinks to open the drawer. I love it that you are so sentimental AND creative. Its great to know that your candy jars filled to the brim with memories. I think that each memories are worth placing them on that candy jars. I think that I should try doing that memory saving on the candy jar.